The HVS-126A is a computerized system to evaluate night vision goggle/device image quality. 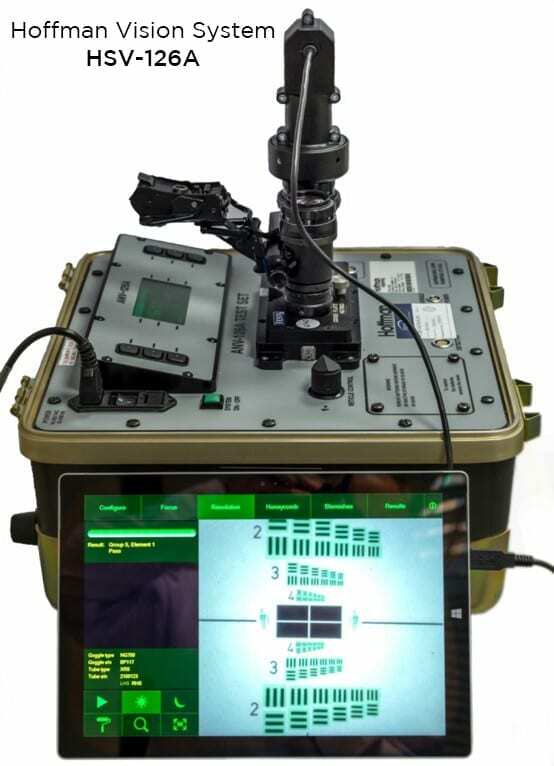 It will quite simply transform the evaluation process to give fast and accurate results time after time, which until now has been a slow and laborious task for NVG maintenance personnel. The HVS-126A uses a high-resolution video camera and lensing to capture live images generated by the Hoffman ANV-126A test set through a night vision goggle/device. The images are analyzed by the proprietary software running on a Microsoft ©Surface Pro 4 Tablet. There is no requirement for the maintenance personnel to be dark adapted, the process may be carried out under normal lighting conditions. Test results are automatically calculated and a Pass / Fail is displayed for Resolution at both high and low light settings, Honeycomb and Spot Defects (Blemishes). This is all achieved in a fraction of the time it would take to carry out this task manually, giving fast, accurate, consistent results and significantly improving productivity and most of all user safety.